There is one area that 99.9% of all nonprofits and ministries can relate to feeling stress and concern about at some point in their journey (or through the entirety of the journey). What is it? Go ahead and sing along with me...money, money, money, money...MONEY!! The number one issue our nonprofit clients share with us is a lack of resources. They have more dreams than they do resources to fulfill those dreams. That’s true about you too, isn’t it? I remember that daunting feeling that we were simply never going to have enough money to accomplish all the things we wanted to accomplish. Raising money seems like a lonely job amidst all of your other responsibilities like casting vision, leading staff, and networking. But someone has to do it, right? Well, the good news is you don’t have to do it alone. We love to help our clients meet their financial goals so they can go after all those God given dreams. Here’s two changes that you could start to make right now that will help get you started. Change #1: Focus 80% on individual giving. A lot of nonprofits want to focus on events to raise funds, which can be time-consuming and extremely expensive. Start focusing your resources on raising money from individual donors. The vast majority of fundraising revenue in Western nations is raised from individuals. Breakthrough nonprofits focus their work where the money is- individual giving. This doesn’t mean you can’t hold events...you certainly can. But you need to focus most of your efforts on individuals. Change #2: Invest more in your donor development program. I have never seen a thriving, rapidly growing nonprofit that penny pinched on fundraising expenditures. An effective fundraising strategy is integral to your nonprofit’s success. Do you know who your donors are? Do you know how to segment them and speak directly to them with asks that are catered to their giving potential? If you don’t have a strategy that grows your donor base, activates them to give, and cultivates a relationship with them through messaging and data partnerships, you are missing out on countless donor opportunities. Donor development and fundraising can be daunting and intimidating to even know where to start and understand what strategies work best for your unique nonprofit or ministry. And raising more money is just one of five keys to our proven formula for nonprofit success. 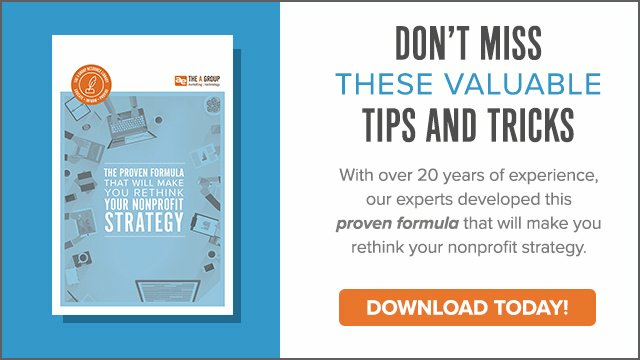 Check out our FREE download below, The Proven Formula That Will Make You Rethink Your Nonprofit Strategy, to unlock the four remaining keys to your nonprofit's growth. It's chock-full of great tips, interactive content and checklists to make sure you are fully equipped effectvely lead your nonprofit.